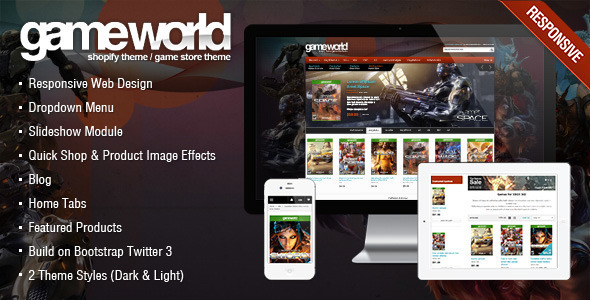 Gameworld is a Best Premium Shopify Themes for Game store designed and developed by ThemeForest?s Top Elite Author. This new theme is responsive, mobile compliance. W3C, HTML5, CSS3 strictly valid and compatible. Theme has custom design for: computer game, video game, mobile game, ios iphone android games, game previews, reviews, buy sell game serial keys, license keys. Bootstrap 3 based, CSS3, SASS, SCSS, mega menu (megamenu) feature, multi-layout, product landing page, blog and cms pages, SEO boost. parallax slideshow. Newsletter subscription is showing on popup. The design is creative, unique, clean, tradional, classic style, glossy, luxury, simplicity, minimal, UX friendly. Display products in many Collections. The Theme is non-Sectioned theme, it doesn’t support Sections feature. Support Response: We are working from 9AM to 5PM, GMT+7, Mon to Fri. When your question come to our system and the Customer support staff will answer it as soon as possible follow the timeline above. They will process ticket/conversation in queue (first come first serve) but they don’t hold your question over 24 hours (except weekend). When your question come to our system at out of office time or weekend, it will be hold to next working day.